This past Tuesday, author and anthropologist Gabriella Coleman came to RIT and talked to a sizable audience about a decreasingly esoteric subject: Anonymous. That makes perfect sense, given that she recently wrote a book covering its history, entitled Hacker, Hoaxer, Whistleblower, Spy: The Many Faces of Anonymous. The concept of Anonymous (as an Internet group) is relatively new (in terms of human history, not Internet history), and most people only have indirect or secondhand experience with it; through TV news reports, “official” Twitter accounts, or occasionally, at protests. Writing about Anonymous has been done quite a bit, so I won’t spend time doing so here. Honestly though, what’s more important than the group Anonymous is the concept of anonymity on the Internet. 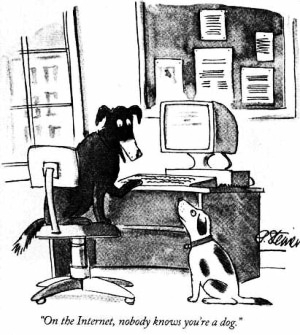 From The New Yorker cartoon by Peter Steiner, 1993. Anonymity has been an important component in online discourse since before I was alive. It serves as an important creative outlet for expression that, due to a variety of reasons (social, physical, economical, etc…) cannot be expressed IRL. It removes the “chilling effect” when something controversial, offensive, or provocative needs to be said. I think anonymity on the Internet has to go away. People behave a lot better when they have their real names down. Unfortunately, Ms. Zuckerberg seems to conflate “behaving better” with complacency. We need anonymous discourse, be it civil or uncivil. Attitudes like Ms. Zuckerberg’s seem to reflect the pervasive incapability of people in my age group (millennials) to be subjected to uncomfortable ideas or thoughts. Young Americans live some of the most comforted lives in the world, rarely, if ever, faced with real threats like starvation or genocide, yet tend to lose all ability to function over reading vapid online opinions or discomforting Tweets. I haven’t read her book, but during her talk, Gabriella made the case for why Anonymous is good for society (they are). But whether or not you support Anonymous, you should support online anonymity. It is essential to the Internet as we know it: A place where things can be said that cannot be said elsewhere. While there is “harm” that results from it, we must bear that cost for the greater good to society.